It’s frustrating when the output to a show command gives exactly the information needed, but in a format which is unintelligible. So it is with the Partner Port State field in the NXOS show lacp neighbor interface command which reports the partner port state as a hexadecimal value. To help with LACP troubleshooting, here’s a quick breakdown of the port states reported on by LACP, and how they might be seen in Junos OS and NXOS. The LACP port state (also known as the actor state) field is a single byte, each bit of which is a flag indicating a particular status. In this table, mux (i.e. a multiplexer) refers to the logical unit which aggregates the links into a single logical transmitter/receiver. 0 LACP_Activity Device intends to transmit periodically in order to find potential members for the aggregate. This is toggled by mode active in the channel-group configuration on the member interfaces. 1 = Active, 0 = Passive. 1 LACP_Timeout Length of the LACP timeout. 2 Aggregation Will allow the link to be aggregated. 3 Synchronization Indicates that the mux on the transmitting machine is in sync with what’s being advertised in the LACP frames. 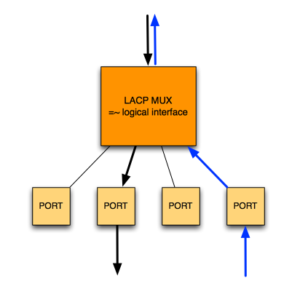 6 Defaulted Whether the receiving mux is using default (administratively defined) parameters, if the information was received in an LACP PDU. However, for the sake of anybody who has been sent output from show lacp neighbor interface port-channel X and wants to understand the hex value that’s displayed (0x3F in this case), it’s pretty simple. Convert hexadecimal to binary. Hexadecimal 0x3F is 00111111 in binary. Alternatively, I suppose, flip the table so that the entries run from 7 to 0 instead of 0 to 7, then you don’t have to flip the bits; either way works. In this case 0x3F indicates a link which is an active part of the aggregated interface. Clearly what we want from a link is that bit 7 is 0 (not expired) and bits 2-5 are 1 (will aggregate, in sync, collecting, distributing). 1 -> ACTIVE mode 1 -> SHORT timeout 1 -> WILL aggregate 0 -> NOT In Sync 0 -> Mux is NOT Collecting 0 -> Mux is NOT Distributing 1 -> Running administratively configured settings 1 -> EXPIRED! Clearly this link was not happy, but thankfully a shut / no shut sequence was enough to revive the patient.